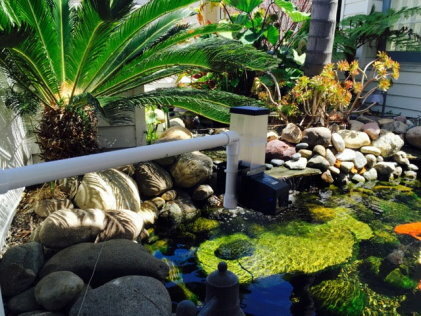 Mount this Koi feeder to a piece of 2x4 hung in the air using a metal pole or wood post or a vertical 2x4 in a bucket filled with concrete and placed in the water (those items not supplied). The L shaped metal bracket can also be attached to a pipe. 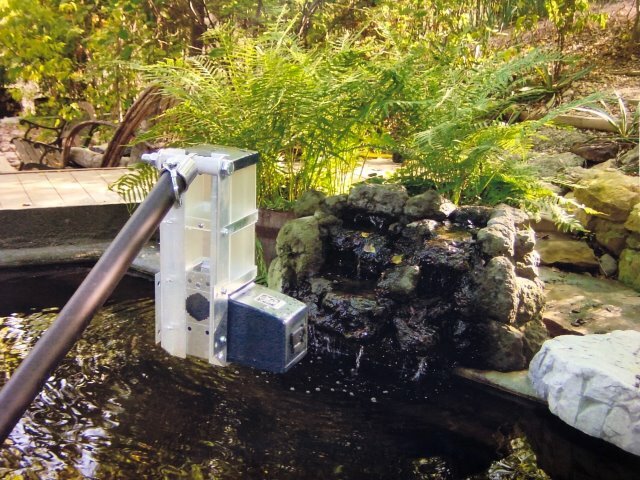 This feeder can be electronically adjusted to feed fish sticks/pellets from a very small portion to a cup or more with multiple cycles. This 1 3/4 Quart size Super FeederCombo Deal includes: Outdoor power supply kit and weatherproof 120V outdoor approved ACAT-32 daily Analog (mechanical) timer to give your fish up to 24 meals per day, all days of the week/year. This KSF-2 Super Feeder come with two tough polycarbonate clear extensions for total capacity of about 1.5 lb. of dry fish food, a polycarbonate protective weatherproofing chute cover over the chute opening and all mounting hardware including a black powder-coated metal "L" shaped mounting bracket and two metal straps. Included with the outdoor power supply kit: One 6' short cord with a special screw-type sealed connector at one end to fit the power supply's output and a jack plug at the other end to fit the Super Feeder's side input jack (handy for calibrating feeder portion indoors before outdoor mounting). One long 30' long wire is also included to reach the Super Feeder with a special screw-type sealed connector at one end to fit the power supply's output and metal spade connectors at the other end to fit the feeder's auxiliary input terminals underneath its floor. As an added bonus if ever needed to use your own wire, a coaxial plug-to-wire adapter is included with this kit. Power supply: Input 110-120Vac 60Hz--Output 12Vac. Timer: Input/ouput: 120Vac 60Hz USA style plugs only-this particular combo is not battery operated. 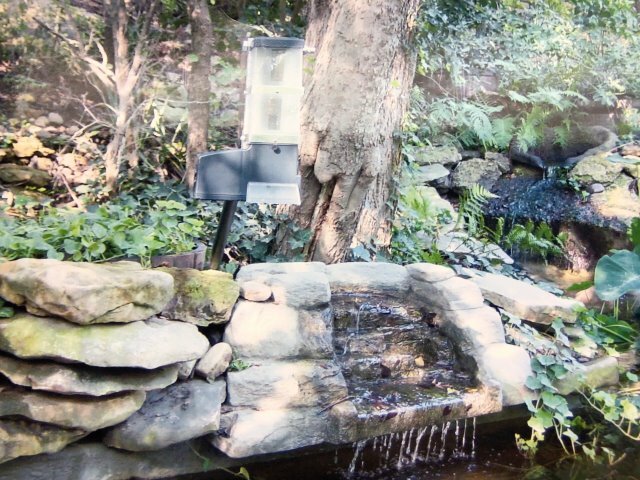 THIS FEEDER WILL REQUIRE MOUNTING ABILITY AND PROPER PROTECTION (info will be provided with your order). When mounting this feeder outdoors, as a minimum, the chute cover area, dispenser and wire, should be adequately protected from wild animals. Overall size of feeder as shown: 7 1/4" x 3 1/2" x 11 3/4"" tall. Additional clear extensions or even a 1.5 gallon hopper is available for more capacity. USA style plugs only-not battery operated but could be an option by purchasing a 12Vdc timer from Super-Feed. You may also operate the feeder with just about any other external timer to plug its power supply into. Original KSF-2 Super Feeder serviceable for years to come, made in USA and sold by Super-Feed for over 23 years! All parts readily available and easy to replace if ever needed. Mount it outdoors or outdoors your very own way to fit your needs. Adjust it from very tiny to larger portions up to 24 times per day all year.